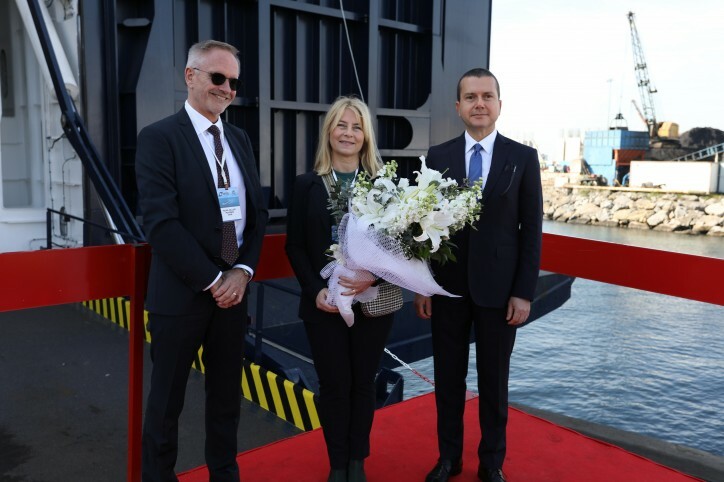 Eva Lundstedt, who is the wife of Volvo’s CEO Martin Lundstedt, gave the ship her name and made a short speech about the importance of this ferry for people in the region and DFDS. It will be the largest freight ferry ever to service DFDS’ customers on routes between Turkey and the EU. Its first departure was on 9 March from Istanbul with arrival in Trieste on 11 March. “We are extremely proud to present this new ferry to our customers. With space for 6,700 lane metres of cargo, our customers, the Turkish and European logistics companies, can look forward to greater capacity,” says EVP Peder Gellert, Head of DFDS Ferry Division. 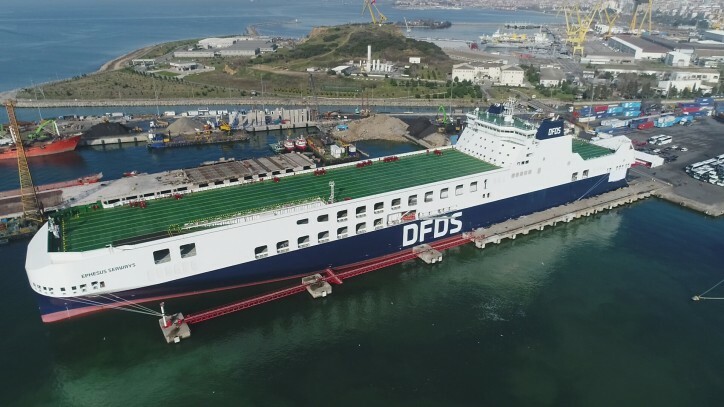 “This ferry is the first of an order of six from the Chinese Jinling Shipyard and will be deployed in DFDS’ route network. It was reflagged under the Turkish flag, and re-named to Ephesus Seaways in accordance with our principle of naming our Mediterranean ships after UNESCO heritage sites in Turkey,” says Selçuk Boztepe, Senior Vice President of DFDS in the Mediterranean. The second of the new mega freight ferries will also join our Turkish fleet when it arrives in late spring. The new freight ferries are each equipped with a unique ramp system with three independent stern ramps and internal ramps, making it possible to load and unload trailers quickly and efficiently. “This means that the freight ferries can be discharged and loaded in record time to enable efficient and reliable transport, to the benefit of the many logistics operators we service in Turkey as well as in the EU, and to the benefit of industries as well,” says Selçuk Boztepe.